In typical Subaru fashion, it's not as wild and angry as the Subaru Legacy Concept from last year, but it looks decent overall. 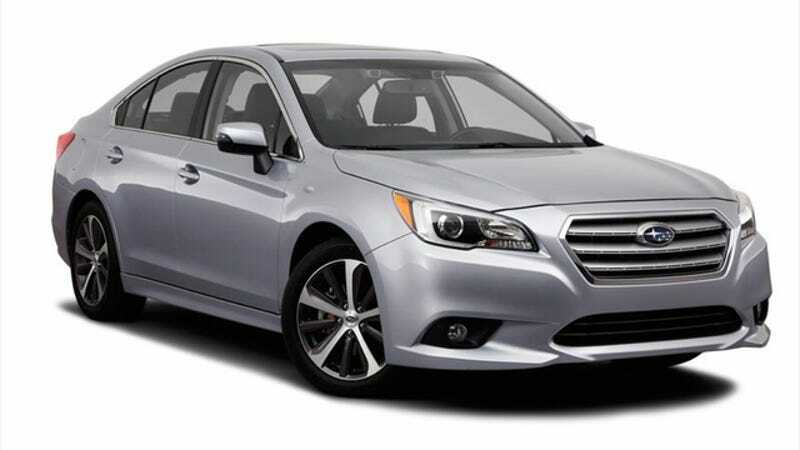 Ladies and gents, meet the 2015 Subaru Legacy. Not bad, right? Photos of the car showed up this morning ahead of its official unveiling at the Chicago Auto Show next week. The 2015 Legacy doesn't look terribly distinctive, but it does seem like kind of a grown-up version of the 2015 WRX, and the more I see that car in person the more I like it. I also think the new Legacy is a huge improvement over the bulbous, awkward-looking sedan it replaces. No word on specs yet, but we can probably expect it with 2.0- and 2.5-liter boxer four engines and who knows, maybe even the 3.6-liter boxer six from the old car. Hey Subaru, how about a Spec B version with a stick shift? Rally hoons need something reasonably respectable to drive if they have kids someday. That car needs to make a comeback.